1. Rub the beef with the oil and season well. Preheat a large frying pan over a high heat, add the beef and sear on all sides for 5 minutes until golden brown. Remove from the heat and transfer to a wire rack to cool. When cool, brush with the mustard. 2. Lay 3 large sheets of clingfilm, overlapping, on the work surface. Put the ham slices on top, overlapping slightly, to form a rectangle 5cm longer than the beef and twice as wide. Add a layer of pâté , then lay the beef on top. Using the clingfilm, wrap the ham and pâté around the beef to form a parcel. Twist the clingfilm ends to secure. Chill for half an hour. 3. Whisk together the egg yolk and milk. Dust the work surface with flour and roll the pastry into a rectangle 10cm longer than the beef parcel and twice as wide. Unwrap the parcel and lay along one long edge of the pastry. 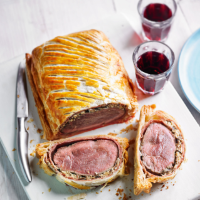 Brush the opposite edge with the egg wash, then roll the beef up in the pastry to form a neat parcel. Press the ends to seal and trim off any excess. Cover and chill for half an hour. 4. Preheat the oven to 200°C, gas mark 6 and heat a baking tray for 10 minutes. Brush the pastry with the remaining egg wash, line the hot baking sheet with greaseproof paper and lay the parcel on top. Bake for 30 minutes for rare, then remove from the oven and leave to rest for 10 minutes before slicing and serving.